Фестиваль «Москва встречает друзей» — самый масштабный проект Международного благотворительного фонда Владимира Спивакова. Он проходит ежегодно с 2004 года на лучших концертных площадках Москвы и Подмосковья: Московский Международный Дом Музыки (Светлановский и Камерный залы), Большой театр России (Бетховенский зал), Московский музыкальный театр им. К. С. Станиславского и В.И. Немировича – Данченко (Музыкальная гостиная) и др. Все участники — юные дарования до 18 лет — представители разных регионов России, СНГ, стран Балтии и дальнего зарубежья (солисты-инструменталисты, вокалисты, танцевальные и хоровые коллективы, цирковые студии, художники, оркестры и дирижеры). Организаторами Фестиваля являются международный благотворительный фонд Владимира Спивакова при непосредственном участии Правительства Москвы и Департамента культуры Москвы, при поддержке Администрации Президента России, Министерства иностранных дел Российской Федерации, Министерства культуры Российской Федерации, Организации Объединенных Наций, ЮНЕСКО, других ведомств и организаций. From May 27 to 5 June Moscow will host XII International festival «Moscow meets friends». 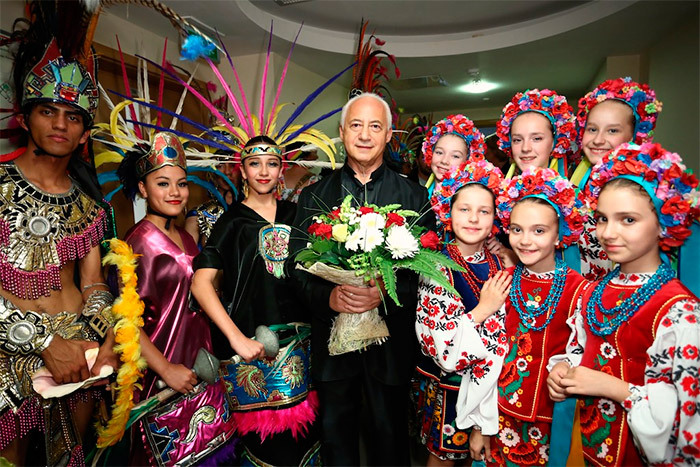 The Festival «Moscow meets friends» is the most ambitious project of the International charitable Fund of Vladimir Spivakov. It is held annually since 2004 in the best concert halls of Moscow and Moscow region: Moscow International House of Music (Svetlanovskiy and Chamber halls), the Bolshoi Theatre of Russia (Beethoven hall), K. S. Stanislavsky and C. I. Nemirovich-Danchenko Moscow Musical Theatre (Music lounge) etc. All participants are young talents under 18 years and representatives of different regions of Russia, CIS, Baltic States and foreign countries (soloists-instrumentalists, vocalists, dance and choral groups, circus studios, painters, orchestras and conductors). The Festival is organized by the International charitable Fund of Vladimir Spivakov with the direct participation of the government of Moscow and the Moscow Department of culture, with the support of the Presidential Administration of Russia, the Ministry of Foreign Affairs of the Russian Federation, Ministry of culture of the Russian Federation, the United Nations, UNESCO and other agencies and organizations. The Organizing Committee consists of prominent politicians, public figures, scientists, representatives of culture and art. The finance for the festival participants at the expense of funds allocated for the festival is in the following amount: transfer from airport (railway station) to hotel, from hotel to venue and back to the hotel, accommodation in the hotel, meals at the scheduled days at the expense of the Organizing Committee of the Festival (only in Moscow). The expenses associated with travel to Moscow and back are the responsibility of the participants. The organizing Committee of the Festival provides accommodation for the member and one companion only for the period of participation in the festival, i.e. from the date of arrival in Moscow, but not before the date of arrival to the Festival, and not later than the next day (12 pm) after the performance. In the case of early request, the festival organizers assist in booking hotels for additional accompanying. Participants perform only with their accompanists. All the expenses associated with staying of accompanist during the Festival are the responsibility of the participants. In a rare exception the Organizing Committee can provide the accompanist upon prior request of the participants. Ensembles (2-3 participants and 1 accompanist) and artistic bands (12 participants and 2 accompanists) come to Moscow and back at their expense (or at the expense of sending to the Festival party/organization), and accommodation, meals and internal transportation is paid by the Organizing Committee of the Festival. Instrumentalists, vocalists, dance and choral groups, painters, representatives of circus genres. 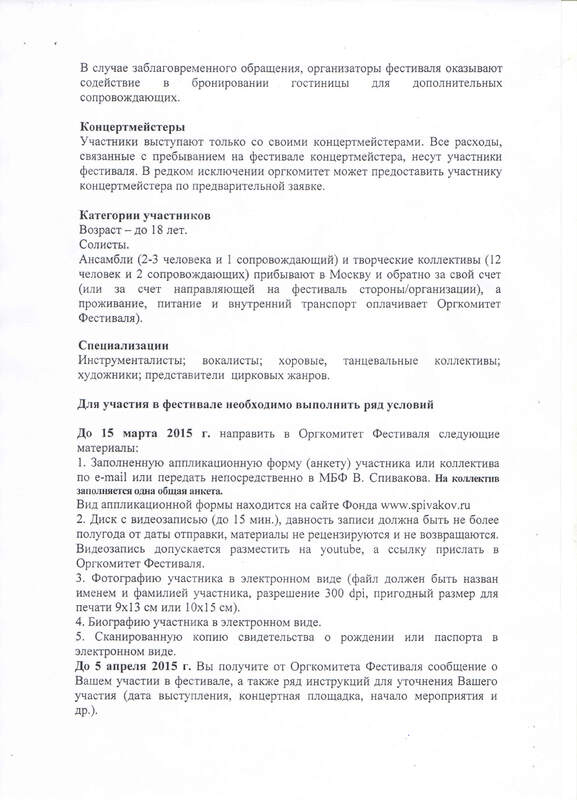 Filled application form (questionnaire) of the participant or group by e-mail or send directly to ICF of V. Spivakov. On a group filled one common questionnaire. 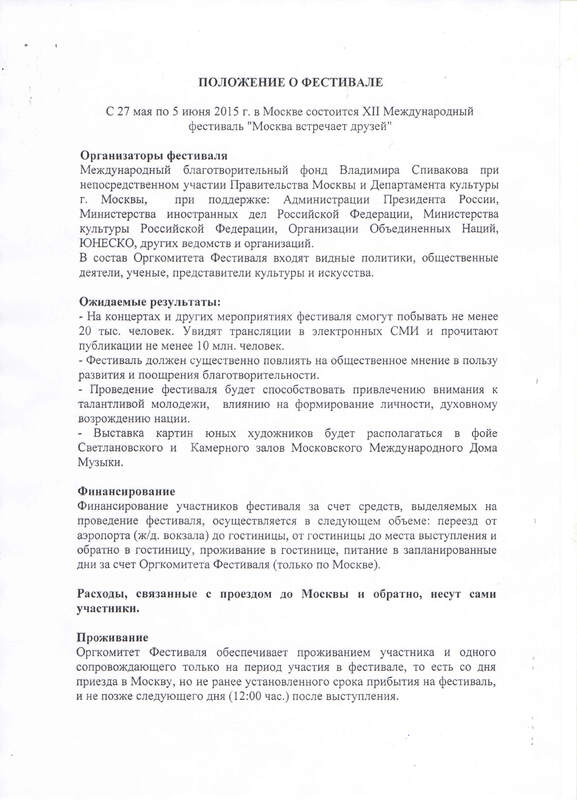 An example of the application form is on the website of the Fund www.spivakov.ru. CD with video clip (no more than 15 minutes), prescription of record must be no more than six months from the date of dispatch, the materials are not reviewed and will not be returned. Video clip is allowed to be post on youtube and the link to be sent to the Organizing Committee of the Festival. The foto of the participant in electronic form (file must be named with the name and surname of the participant, resolution 300 dpi, suitable size for printing is 9×13 cm or 10×15 cm). The biography of the participant in electronic form. Until April 5, 2015 you will receive a message from the Organizing Committee of the Festival about your participation in the Festival, as well as a number of instructions to refine your participation (date performances, concert venue, beginning of the Festival etc. ).